Are You a Boy or a Girl? 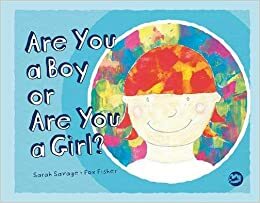 (2015), co-written by Sarah Savage and Fox Fisher, who is also the picture book’s illustrator, is the story of nonbinary Tiny. Tiny and their family, who are illustrated with various skin-tones, move to a new home where no one knows Tiny. They experience bullying at their new school, but that’s not the whole story.Tiny and their younger sister, Fiona, like to play dress up together, and everyone in the family is quite supportive of Tiny’s non-binary gender identification. At their new school Tiny does run into the requisite bully, but their new teacher is supportive and they quickly make amazing friends. The bully cannot come up with a good argument when confronted about his gender policing so it seems to sputter out. When asked politely by a curious new friend about their gender identity, Tiny refuses binary gender identity. Everyone seems to accept this. Minor characters including Tiny’s pasta-making father and a woman firefighter that shows up at Tiny’s school, subtly challenge gender stereotypes. Even more, Fisher illustrated an impressively inclusive cast of characters with various abilities, body types, and skin-tones. The creators introduce a serious theme in an accessible and fun way. Questions at the back of the book can prompt productive discussion about many aspects of gender. I recommend this for personal and classroom libraries. Both creators are trans* activists and community members. I hope to see more by them!